Were you hoping to catch the Bare Bones staged reading of Mrs. Hawking part three, Base Instruments, but couldn’t make the performance date? Well, turns out you are in luck, because we were able to capture the reading for your listening pleasure! 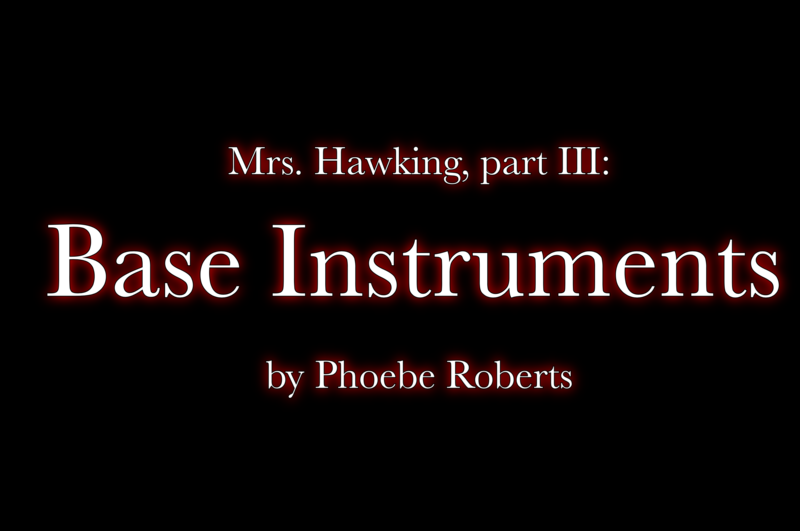 The following two files on the Mrs. Hawking YouTube channel have recording of the audio of the Base Instruments reading. Act one is in the first recording and act two is in the second. The quality is not perfect, as they were recorded on the fly during the reading, but they do a good job capturing the performances and the reactions of the audience. What I particularly enjoy about these is they preserve the natural responses of the listeners in the moment. I really enjoy noting what lines got laughs– Eric Cheung as Justin Hawking had scenes where it was almost a one-to-one laugh-to-line ratio! And I really got a kick out of the charmed reaction they had to the scene between Mary and Arthur. It even draws my attention to where there WASN’T the response I was expecting, so I know where to examine more closely for editing. And of course it captures the awesome performances of the actors. I was really lucky to work with such a talented cast, many of whom were switching not just between characters, but also accents! So if you missed the Bare Bones reading, please give these a listen. It’s a great way to take in the story of Base Instruments, performed by talented people with live audience feedback, just the way a show like that is intended.